At a seminar on healing we once heard a woman tell of an exercise that relieved her of her troubles. She said she walked around a large park with a canvas sack. For every problem in her life, she picked up a big rock, associated it with the problem, and put the rock in her sack. She said that by the time she had finished putting all the rocks in her sack, she could hardly carry or drag it around--that's how many problems she had been carrying around with her. When she was done, she dragged her sack over to a lake in the park. She then took each rock out of the sack one by one and, saying goodbye, heaved each rock as far as she could into the lake. At the end of the entire process, she left the park with an empty sack and a very light heart. Does Her Method Have a Magical Basis? Her story was so inspiring and wonderful that we began thinking about the magical basis for her method--and discovered that it was actually valid and useful. Her method falls under the category of simulacra magic, in which physical objects are used to represent person, place, or thing in life. It's also known as voodoo or Vodun magic. Once you correlate the physical object to the person, place, or thing in life, what you do to the object you also do to the person, place, or thing. What the woman did with her rocks was to create a correlation or psychic connection between a rock and a problem in her life. When she threw each rock into the lake, she severed her physical connection to the rock and, by the laws of simulacra magic, also her connection to her problem. Now you obviously want to be careful with this approach because it's powerful. You don't want to associate a person with a rock, and then throw the rock into the lake--you would drown the person (and be subject to quite a bit of negative Universal feedback according to Rules of the Road). What you can do is connect your resentments, fears, angers, and other negative emotions to rocks and then throw them into the lake. You can also bury the rocks and allow Mother Earth to cleanse them for you (leave them buried for at least one moon cycle). It's a great way to unload! What's fascinating is that if you look at almost any tradition or method like this, you can find the magical operational laws at work in the process! You can also channel unwanted thoughts and emotions into specular hematite stones, which can absorb a lot of them. These stones can move those emotions out of you and into a safe place. 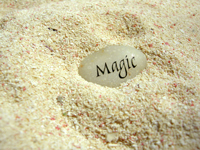 Many magical practitioners carry these stones around in their pockets for just this purpose. They cleanse them every month or so by smudging them with sage and pine resin to keep them clean.